Oct. 19, 2017 6:30 a.m.
What began as a subdued memorial for Gord Downie organized by city officials in his Kingston, Ont. hometown erupted into an improvised candlelight vigil on Wednesday night with residents taking over the proceedings. 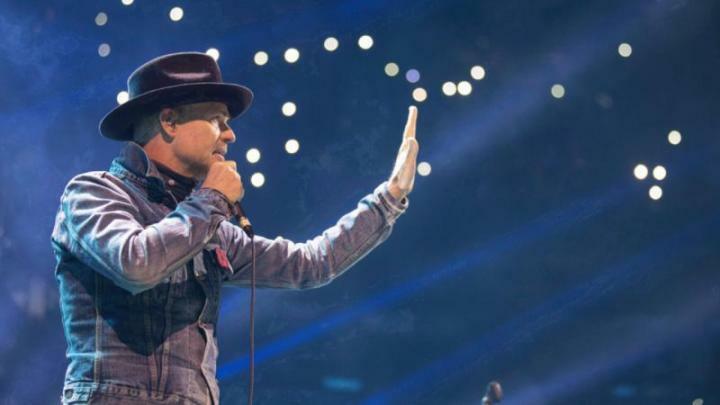 Tearing a page from the Tragically Hip frontman’s own taste for the unexpected and impromptu, fans paid tribute to the performer with sing-alongs, breakout dance parties and, in one case, broadcasting classic Hip concerts from a flatscreen TV in the back of a van. It was a vibrant finale to what started as a formal event honouring of one of Canada’s most prolific band leaders. Downie, who was diagnosed with incurable brain cancer, died Tuesday at 53. Upon hearing of Downie’s passing, Jerzy Bohatkiewicz convinced his wife to join him on a five-hour road trip from Wiarton, Ont., to Kingston. He wanted to contribute by throwing open the back doors of his van and playing DVDs of Hip concerts on his TV. “My heart dropped when I heard Downie passed away and I looked at my wife and I says, ‘Honey, let’s go down (to) Kingston and do a tribute to the boy,’” Bohatkiewicz said. Before he pulled into Kingston’s Springer Market Square, other locals were marking Downie’s life and legacy in their own ways. The evening began with a couple hundred people milling around the same city square where thousands gathered on Aug. 20, 2016, to watch a public screening of the band’s sold-out final concert. This time, some brought flowers to place around a commemorative stone for the band. Others shared candles with strangers and recalled their favourite memories of the singer. A banner was splayed out for people to write their own tributes. When the sheet was full, someone dragged in a large wooden flower to offer space for more messages. A few steps away, hundreds of people lined up throughout the day to sign a book of condolences. But as Downie’s unmistakable voice echoed over the loud speakers, the crowd’s energy shifted and a heavy sadness that weighed over Kingston began to lift. It started when ”Ahead By a Century” started playing. One man pulled out his guitar and led the crowd in a sing-along that picked up steam with every verse. Elsewhere, a group of friends bust out dance moves for “Blow at High Dough” a few moments later. Robert Easter stood alongside his wife and two children as the celebratory spirit took hold. “Everybody here has probably had Gord Downie and the Tragically Hip in their life,” he said. Others talked about how they admired the performer taking control of his final days with his fundraising efforts for brain cancer and the “Secret Path” project which drew attention to the plights of Canada’s Indigenous people. “It’s a testament to what he’s meant to Canadians,” said Stan MacLachlan, a Toronto resident who decided to stop by the memorial while visiting his son at Queen’s University. Still, it was tough for many to face the reality that after saying goodbye to the Tragically Hip, it was finally time to bid farewell to Downie in life. “It was a moment we all knew was coming, we just didn’t know when,” said Scott Hallman, who runs a hot dog stand in a local park. Tammy Bush brought her children to witness the outpouring of emotion firsthand. Wiping away a few tears, she fondly remembered taking her 15-year-old son Brad Francis to the Hip’s final Ottawa show — her son’s first live concert. “I told him, ‘You’re never going to see another concert like that.’ The emotion in that building was incredible,” she said. Bush then paused to reflect on the lingering calm in Kingston as the community digests news of Downie’s passing. “It’s a different feeling in the city today without him,” she said. Earlier, Kingston Mayor Bryan Paterson laid a wreath dedicated to Downie at city hall, which was illuminated in red and white in the evening to honour Downie. “It’s tragic news and a sad day for Kingston,” Paterson said. Outside the local arena, where Downie and the Hip played their final show in August 2016, a public bench was turned into a more sombre memorial a few steps away from a rock radio station. Passersby stopped in silence to look at several items left for the tribute, including a fedora similar to the ones Downie wore on the “Man Machine Poem” tour that was nestled between a blanket of flowers. There was an uncommon slowness in Justin Trudeau’s step Wednesday morning as he walked toward the weekly Liberal caucus meeting on Parliament Hill, his thoughts weighed heavily with the news that Tragically Hip frontman Gord Downie had died. “I thought I was going to make it through this but I’m not,” the prime minister said, his voice cracking with emotion, tears streaming down his face. Trudeau added that Canada was less of a country for having lost Downie. There was a personal connection between the prime minister and the musician that was only seen publicly on a few occasions. As his band wrapped up a 15-stop farewell tour in Kingston, Ont., in the summer of 2016, Downie called out to Trudeau, who was in the audience, urging him to take action on behalf of Canada’s Indigenous peoples, to make their lives better. Before that show, Trudeau embraced Downie backstage and later described the bittersweet moment as both a celebration of Downie’s life and a chance to say goodbye. In the months that followed, it was evident that Trudeau had taken the singer’s message to heart as his government took several steps to reconcile with Indigenous communities over the treatment of aboriginal children and families under the residential schools program. 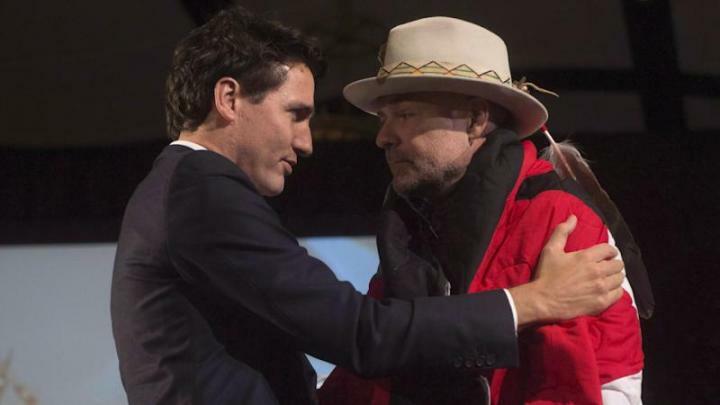 On Wednesday, through tear-welled eyes, Trudeau commended Downie for his love of country, his profound ability to use words to create landscapes and his dedication to the plight of Indigenous Canadians. “Gord was my friend, but Gord was everyone’s friend,” Trudeau said. “He knew, as great as we were, we needed to be better than we are,” he added.